When you have a custom Access web app and you’re ready to share it beyond its original site, you can save the app as a package and upload the package to your App Catalog site or to the SharePoint Store. We’ll walk you through the steps. 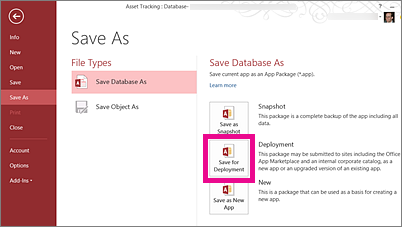 When you’re saving your web app for distribution to an App Catalog or to the SharePoint Store, Save for Deployment is the best option. This option lets you lock the web app so users can’t change it. This option also lets you upgrade the web app later, after you make updates and you want to distribute those updates to the web app in the App Catalog or the SharePoint Store. Open the web app in Access and click File > Save As > Save for Deployment. Note: If you don’t see the Save for Deployment option, your Access web app isn’t on an Office 365 or SharePoint Online site, or you don’t have Office 2013 Service Pack 1 (SP1) or higher installed on your computer. You can still save your web app as a package, but you won’t have as many options, such as the option to lock an app. Enter a title for the web app package and adjust the version number, if necessary. Leave the Locked check box selected if you want to keep users from updating the web app that you distribute. Caution: Before you lock your web app, make sure you save an unlocked copy of the web app. Otherwise, you won’t be able to open your web app for editing. 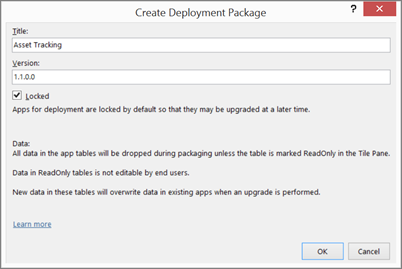 For more information about the save for deployment option and other options, see Create an Access app package. Now that you have a web app package, you’re ready to distribute it in the App Catalog or the SharePoint Store. Choose one of the next sections that applies to your situation. The App Catalog site is a private place where people in your organization can distribute and manage custom apps that others can add to their sites. If you haven’t uploaded an Access web app to your App Catalog before, you might have other steps to do first, including create the App Catalog site if it hasn’t been created yet. See Use the App Catalog to make custom business apps available for your SharePoint Online environment. Go to the App Catalog site. If you’re the SharePoint Online Administrator, at the top of your site, click Admin > SharePoint > Apps > App Catalog, and then click the name of your App Catalog site. Note: If you’re not the SharePoint Online Admin, you won’t see the Admin link and you’ll need to get the URL for your App Catalog site from the Admin. You need to be at least a site collection administrator for the App Catalog site to upload to the App Catalog. 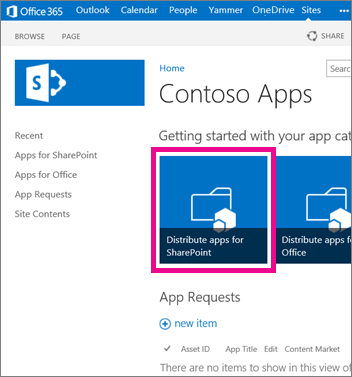 On the home page of the App Catalog site, click the Distribute apps for SharePoint tile (or click Apps for SharePoint in the navigation). In the Apps for SharePoint library, click new app. Browse to the .app package file you saved earlier, and then click OK. If you have an icon you want to use to represent the app in the App Catalog, enter a URL for that in the Icon URL field. If you want to categorize the app so that it appears under a specific category, select or specify a Category. If you want to offer help and how-to information to app users, enter a URL for that in the Support URL field. If you want the app to be listed in the Noteworthy content view of the App Catalog, select the Featured check box. Your Access web app should now be available for people to add to their sites by clicking Settings > Add an app. If you are updating your web app, people who have added a previous version of your web app to a site will now see an opportunity to upgrade the web app on their site. The SharePoint Store is the public marketplace where people share and sell apps to other users of SharePoint worldwide. 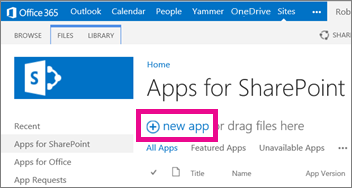 If you haven’t uploaded an app to the SharePoint Store before, you likely have a few steps to do first. For help, see Publish apps for SharePoint or consider uploading to an App Catalog that your organization has created.